A central processing unit (CPU), often called the processor, is the component in an electronic computer that performs all the active processing of its programming directions, and manipulation of data; this includes performing calculations on numbers, and determining which particular steps to perform. The particular function to be performed at any point in time is based on a machine instruction, also called a machine code, or opcode, which is generally automatically retrieved from the memory. A sequence of opcodes, executed sequentially, is called a computer program. Depending on the exact design of the particular CPU, arithmetic operations may be performed on two numbers that have previously been stored inside the processor in special storage elements called registers, or one or both may be retrieved from memory. After a calculation is performed, the resulting (newly calculated) number may be retained in a register, or written back to the computer's memory (again, depending on the particular CPU at hand). Today's processors also do much more than just perform operations selected by program opcodes; they also perform data flow analysis on the instruction stream and apply a number of advanced heuristics to improved the throughput rate of instructions. Some techniques for speeding up processors are discussed in the this article. For more information, see computer architecture. A processor that is manufactured as a single integrated circuit is usually known as a microprocessor. Most CPUs in modern computers are microprocessors, and microprocessors are also used in many everyday items, from automobiles and household appliances to cellular phones and children's toys. 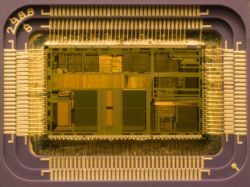 The phrase "central processing unit" and its abbreviation, CPU, have been used in the computer industry dating back to at least the 1960s (Weik 1961). The term is a description of a certain class of logic machines that can execute instructions. This broad definition can easily be applied to many early computers that existed long before the term "CPU" ever came into widespread usage. The form, design and implementation of CPUs have changed dramatically since the earliest examples. For more information, please see the history of processors article. The basic operation of most CPUs, regardless of the physical form they take, is to execute a sequence of stored instructions called a program. The program is represented by a series of numbers that are stored in some kind of memory. There are four steps that many CPUs use in interacting with this data: fetch, decode, execute, and writeback. CPUs that follow this design of storing and calling up data are following the von Neumann architecture, commonly used in CPUs today. The first step, fetch, involves retrieving an instruction from memory. The location in program memory is determined by a program counter, which is a register that first determines the sequence of instructions to be executed, then stores those instructions by that sequence in memory. In other words, the program counter keeps track of the CPU's place in the current program. After an instruction is fetched, the program counter is incremented by the length of the instruction word in terms of memory units. Often the instruction to be fetched must be retrieved from relatively slow memory, causing the CPU to stall while waiting for the instruction to be returned. This is known as a bottleneck. The instruction that the CPU fetches from memory is used to determine what the CPU is to do. In the decode step, the instruction is broken up into parts that different portions of the CPU can interpret. The way in which the numerical instruction value is interpreted is defined by the CPU's instruction set architecture (ISA). Often, one group of bits in the instruction, called the opcode, indicates which operation to perform. The remaining parts of the number usually provide information required for that instruction, such as operands for an addition operation. Such operands may be given as a constant value (called an immediate value), or as a reference to the value's location: a register or a memory address. In older designs the portions of the CPU responsible for instruction decoding were fixed hardware devices. However, in more abstract and complicated CPUs and ISAs, a microprogram is often used to assist in translating instructions into various configuration signals for the CPU. This microprogram is sometimes rewritable so that it can be modified to change the way the CPU decodes instructions even after it has been manufactured. After the fetch and decode steps, the execute step is performed. During this step, various portions of the CPU are connected so they can perform the desired operation. If, for instance, an addition operation was requested, an arithmetic logic unit (ALU) will be connected to a set of inputs and a set of outputs. The inputs provide the numbers to be added, and the outputs will contain the final sum. The ALU contains the circuitry to perform simple arithmetic and logical operations on the inputs (like addition and bitwise operations). If the addition operation produces a result too large for the CPU to handle, an arithmetic overflow flag in a flags register may also be set (see the discussion of integer range below). After the execution of the instruction and writeback of the resulting data, the entire process repeats, with the next instruction cycle normally fetching the next-in-sequence instruction because of the incremented value in the program counter. If the completed instruction was a jump, the program counter will be modified to contain the address of the instruction that was jumped to, and program execution continues normally. In more complex CPUs than the one described here, multiple instructions can be fetched, decoded, and executed simultaneously. This section describes a simplified form of what is generally referred to as the "Classic RISC pipeline," which in fact is quite common among the simple CPUs used in many electronic devices (often called microcontrollers). Related to number representation is the size and precision of numbers that a CPU can represent. In the case of a binary CPU, a bit refers to one significant place in the numbers a CPU deals with. The number of bits (or places) a CPU uses to represent numbers is often called "word size", "bit width", "data path width", or "integer precision" when dealing with strictly integer numbers (as opposed to floating point). This number differs between architectures, and often within different parts of the very same CPU. For example, an 8-bit CPU deals with a range of numbers that can be represented by eight binary digits (each digit having two possible values), that is, 28 or 256 discrete numbers. In effect, integer size sets a hardware limit on the range of integers the software run by the CPU can utilize. Higher levels of integer range require more structures to deal with the additional digits, and therefore more complexity, size, power usage, and generally expense. It is not at all uncommon, therefore, to see 4- or 8-bit microcontrollers used in modern applications, even though CPUs with much higher range (such as 16, 32, 64, even 128-bit) are available. The simpler microcontrollers are usually cheaper, use less power, and therefore dissipate less heat, all of which can be major design considerations for electronic devices. However, in higher-end applications, the benefits afforded by the extra range (most often the additional address space) are more significant and often affect design choices. To gain some of the advantages afforded by both lower and higher bit lengths, many CPUs are designed with different bit widths for different portions of the device. For example, the IBM System/370 used a CPU that was primarily 32 bit, but it used 128-bit precision inside its floating point units to facilitate greater accuracy and range in floating point numbers (Amdahl et al. 1964). Many later CPU designs use similar mixed bit width, especially when the processor is meant for general-purpose usage where a reasonable balance of integer and floating point capability is required. Most processors, and indeed most sequential logic devices, operate synchronously. Processors "make a move" each time a synchronization signal occurs. This signal, known as a clock signal, usually takes the form of a periodic square wave. By calculating the maximum time that electrical signals can propagate throughout various branches of a processor's many circuits, designers can select an appropriate period for the clock signal. Architectural improvements alone do not solve all of the drawbacks of globally synchronous CPUs, however. For example, a clock signal is subject to the delays of any other electrical signal. Higher clock rates in increasingly complex CPUs make it more difficult to keep the clock signal in phase (synchronized) throughout the entire unit. This has led many modern CPUs to require multiple identical clock signals to be provided in order to avoid delaying a single signal significantly enough to cause the CPU to malfunction. Another major issue as clock rates increase dramatically is the amount of heat that is dissipated by the CPU. The constantly changing clock causes many components to switch regardless of whether they are being used at that time. In general, a component that is switching uses more energy than an element in a static state. Therefore, as clock rate increases, so does heat dissipation, causing the CPU to require more effective cooling solutions. One method of dealing with the switching of unneeded components is called clock gating, which involves turning off the clock signal to unneeded components (effectively disabling them). However, this is often regarded as difficult to implement and therefore does not see common usage outside of very low-power designs. Another method of addressing some of the problems with a global clock signal is the removal of the clock signal altogether. While removing the global clock signal makes the design process considerably more complex in many ways, asynchronous (or clockless) designs carry marked advantages in power consumption and heat dissipation in comparison with similar synchronous designs. While somewhat uncommon, entire CPUs have been built without utilizing a global clock signal. Two notable examples of this are the ARM compliant AMULET and the MIPS R3000 compatible MiniMIPS. Rather than totally removing the clock signal, some CPU designs allow certain portions of the device to be asynchronous, such as using asynchronous ALUs in conjunction with superscalar pipelining to achieve some arithmetic performance gains. While it is not altogether clear whether totally asynchronous designs can perform at a comparable or better level than their synchronous counterparts, it is evident that they do at least excel in simpler math operations. This, combined with their excellent power consumption and heat dissipation properties, makes them very suitable for embedded computers (Garside et al. 1999). Another strategy commonly used to increase the parallelism of CPUs is to include the ability to run multiple threads (programs) at the same time. In general, high-TLP CPUs have been in use much longer than high-ILP ones. Many of the designs pioneered by Cray during the late 1970s and 1980s concentrated on TLP as their primary method of enabling enormous (for the time) computing capability. In fact, TLP in the form of multiple thread execution improvements was in use as early as the 1950s (Smotherman 2005). In the context of single processor design, the two main methodologies used to accomplish TLP are chip-level multiprocessing (CMP) and simultaneous multithreading (SMT). On a higher level, it is very common to build computers with multiple totally independent CPUs in arrangements like symmetric multiprocessing (SMP) and non-uniform memory access (NUMA). While using very different means, all of these techniques accomplish the same goal: increasing the number of threads that the CPU(s) can run in parallel. The CMP and SMP methods of parallelism are similar to one another and the most straightforward. These involve little more conceptually than the utilization of two or more complete and independent CPUs. In the case of CMP, multiple processor "cores" are included in the same package, sometimes on the very same integrated circuit. SMP, on the other hand, includes multiple independent packages. NUMA is somewhat similar to SMP but uses a nonuniform memory access model. This is important for computers with many CPUs because each processor's access time to memory is quickly exhausted with SMP's shared memory model, resulting in significant delays due to CPUs waiting for memory. Therefore, NUMA is considered a much more scalable model, successfully allowing many more CPUs to be used in one computer than SMP can feasibly support. SMT differs somewhat from other TLP improvements in that it attempts to duplicate as few portions of the CPU as possible. While considered a TLP strategy, its implementation actually more resembles superscalar design, and indeed is often used in superscalar microprocessors (such as IBM's POWER5). Rather than duplicating the entire CPU, SMT designs only duplicate parts needed for instruction fetching, decoding, and dispatch, as well as things like general-purpose registers. This allows an SMT CPU to keep its execution units busy more often by providing them instructions from two different software threads. Again, this is very similar to the ILP superscalar method, but simultaneously executes instructions from multiple threads rather than executing multiple instructions from the same thread concurrently. A less common but increasingly important paradigm of CPUs (and indeed, computing in general) deals with vectors. The processors discussed earlier are all referred to as some type of scalar device. As the name implies, vector processors deal with multiple pieces of data in the context of one instruction. This contrasts with scalar processors, which deal with one piece of data for every instruction. These two schemes of dealing with data are generally referred to as SISD (single instruction, single data) and SIMD (single instruction, multiple data), respectively. The great utility in creating CPUs that deal with vectors of data lies in optimizing tasks that tend to require the same operation (for example, a sum or a dot product) to be performed on a large set of data. Some classic examples of these types of tasks are multimedia applications (images, video, and sound), as well as many types of scientific and engineering tasks. Whereas a scalar CPU must complete the entire process of fetching, decoding, and executing each instruction and value in a set of data, a vector CPU can perform a single operation on a comparatively large set of data with one instruction. Of course, this is only possible when the application tends to require many steps which apply one operation to a large set of data. a b Amdahl, G. M., Blaauw, G. A., & Brooks, F. P. Jr. (1964). Architecture of the IBM System/360. IBM Research. a Brown, Jeffery (2005). Application-customized CPU design. IBM developerWorks. Retrieved on 2005-12-17.
a Digital Equipment Corporation (November 1975). “LSI-11 Module Descriptions”, LSI-11, PDP-11/03 user's manual, 2nd edition. Maynard, Massachusetts: Digital Equipment Corporation, 4-3.
a Garside, J. D., Furber, S. B., & Chung, S-H (1999). AMULET3 Revealed. University of Manchester Computer Science Department. a MIPS Technologies, Inc. (2005). MIPS32® Architecture For Programmers Volume II: The MIPS32® Instruction Set. MIPS Technologies, Inc..
a Smotherman, Mark (2005). History of Multithreading. Retrieved on 2005-12-19.
a von Neumann, John (1945). First Draft of a Report on the EDVAC. Moore School of Electrical Engineering, University of Pennsylvania. a b Weik, Martin H. (1961). A Third Survey of Domestic Electronic Digital Computing Systems. Ballistic Research Laboratories. Intel Corp - Intel, a maker of several notable CPU lines, including IA-32, IA-64, and XScale. Also a producer of various peripheral chips for use with their CPUs. Texas Instruments - Texas Instruments semiconductor division. Designs and manufactures several types of low power microcontrollers among their many other semiconductor products. Processor Design: An Introduction - Detailed introduction to microprocessor design. Somewhat incomplete and outdated, but still worthwhile. ↑ Early CPUs were custom-designed for each new kind of computer. Custom processors gave way to mass-produced, general-purposes processors. This trend accelerated with the advent of the integrated circuit (IC), which allowed processors to become tiny (on the order of millimeters). Miniaturization and standardization led to additional uses, such as in personal digital assistants (PDA's). ↑ While a processor's integer size determines maximum integer ranges, this can (and often is) overcome using a combination of software and hardware techniques. By using additional memory, software can represent integers many magnitudes larger than the processor can. Sometimes the processor's ISA will even facilitate operations on integers larger that it can natively represent by providing instructions to make large integer arithmetic relatively quick. While dealing with large integers in software is somewhat slower than utilizing a wider integer size in the processor hardware, it is a reasonable trade-off where wider integers in hardware would be cost-prohibitive. See Arbitrary-precision arithmetic for more on purely software-supported, arbitrary-sized integers. ↑ Neither ILP nor TLP is inherently superior over the other; they are simply different means by which to increase CPU parallelism. As such, they both have advantages and disadvantages, which are often determined by the type of software that the processor is intended to run. High-TLP CPUs are often used in applications that lend themselves well to being split up into numerous smaller applications, so-called "embarrassingly parallel problems." Frequently, a computational problem that can be solved quickly with high TLP design strategies like SMP take significantly more time on high ILP devices like superscalar CPUs, and vice versa. ↑ Even though SMP and NUMA are both referred to as "systems level" TLP strategies, both methods must still be supported by the CPU's design and implementation. ↑ While TLP methods have generally been in use longer than ILP methods, Chip-level multiprocessing is more or less only seen in later IC-based microprocessors. This is largely because the term itself is inapplicable to earlier discrete component devices and has only come into use recently. For several years during the late 1990s and early 2000s, the focus in designing high performance general purpose CPUs was largely on highly superscalar IPC designs, such as the Intel Pentium 4. However, this trend seems to be reversing somewhat now as major general-purpose CPU designers switch back to less deeply pipelined high-TLP designs. This is evidenced by the proliferation of dual and multi core CMP designs and notably, Intel's newer designs resembling its less superscalar P6 architecture. Late designs in several processor families exhibit CMP, including the x86-64 Opteron and Athlon 64 X2, the SPARC UltraSPARC T1, IBM POWER4 and POWER5, as well as several video game console CPUs like the Xbox 360's triple-core PowerPC design. ↑ Earlier the term scalar was used to compare the IPC (instructions per cycle) count afforded by various ILP methods. Here the term is used in the strictly mathematical sense to contrast with vectors. See scalar (mathematics) and vector (spatial). ↑ Although SSE/SSE2/SSE3 have superseded MMX in Intel's general purpose CPUs, later IA-32 designs still support MMX. This is usually accomplished by providing most of the MMX functionality with the same hardware that supports the much more expansive SSE instruction sets. This page was last modified 02:55, 27 April 2008.